Desh Bhagat Dental College and University Department of Media Entertainment and Film Technology arranged an interaction of its students with the cast of the soon to be released Punjabi Film "Rabb Da Radio". Famous actress Mandy Takkhar who is in lead role of the film, came to the university, along with her team. The film team had come for the promotion of their film and they regaled the students of the university with dialogues and songs of the upcoming movie. 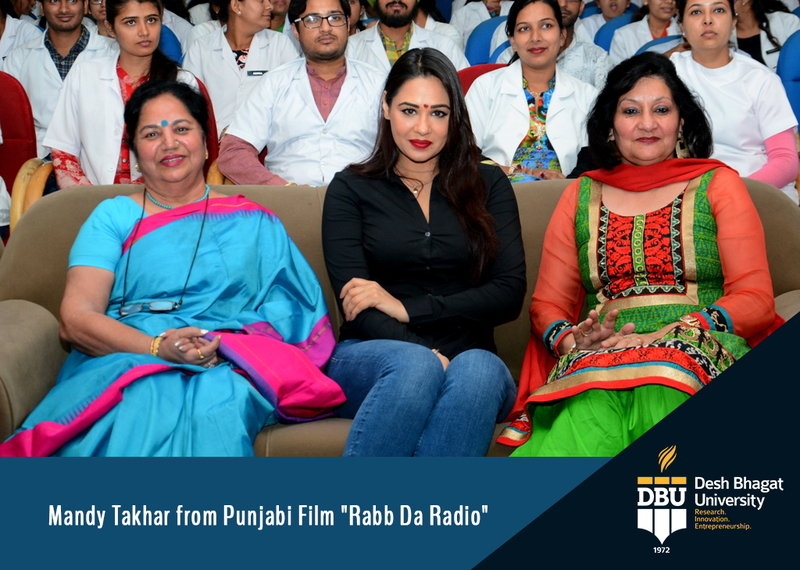 University Pro Chancellor Dr. Tajinder Kaur, Dr. Surjit Patheja and and Principal Desh Bhagat Dental College Dr. Neeru Singh welcomed Mandy Takhar and other artists with bouquets and conveyed them their best wishes for the success of their newly coming film. Speaking about her new film, Mandy Takhar said that this is a love-drama-comedy movie and the music of this film has already gained lot of popularity among the Punjabis. The film will be released on 31st of March, 2017. 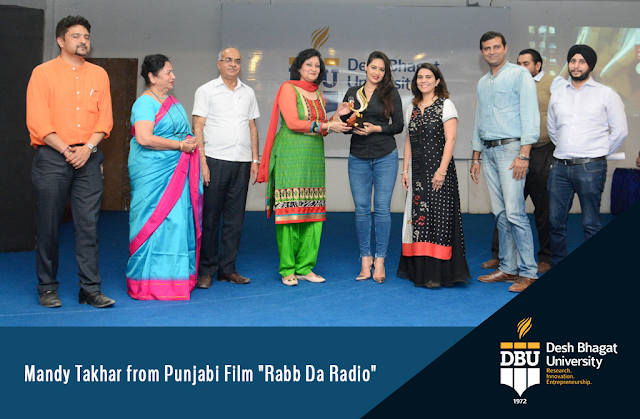 Interacting with the students, Mandy Takhar observed that the story of this film is very interesting and it will be liked by people of every age and every section of the society. When she performed on the songs of the film, the students enjoyed these so much that they started dancing out of joy. She also entertained the students with their old and new film dialogues. Chancellor Dr. Zora Singh and Vice-Chancellor Dr. Virinder Singh wished good luck to the film team and said that Punjabi Films have made a respectable place in the film world and the need of the hour is to make such films as can entertain as well as educate the viewers and give right direction to the society.